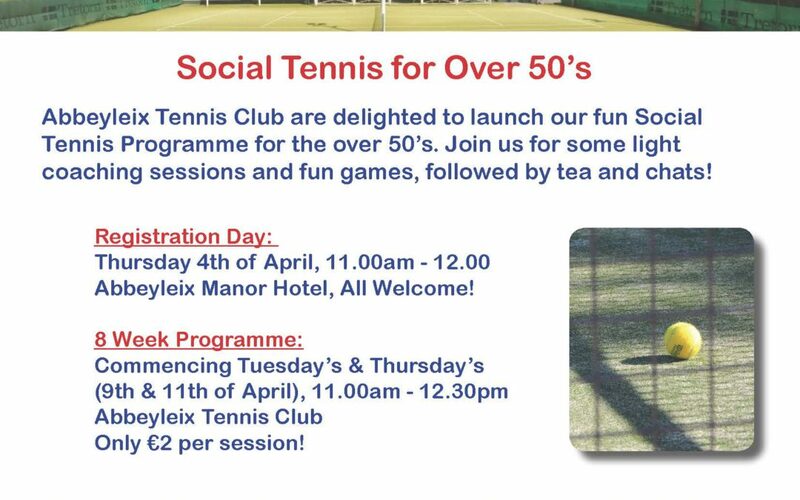 Laois Sports Partnership in partnership with Abbeyleix Tennis Club announces the opening of a Social Tennis Programme for over 50’s in Abbeyleix Tennis Club. This new initiative will be launched with registration on the 4th of April 2019 in Abbeyleix Manor Hotel at 11am, All welcome. The programme will then commence on 9th April at 11am Tuesdays and Thursday in Fr. Breen Memorial Park, just off the main street of the town. Since its establishment in 1909, Abbeyleix Tennis Club has been (and still is) renowned for its ability to welcome people of all ages and ability into their club, and by launching the aforementioned initiative, the club is once again showing its welcoming nature. 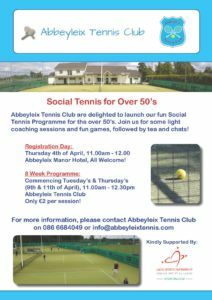 This launch is aimed at any person over the age of 50 who has previously played tennis or has been a member of the Abbeyleix Tennis Club in the past. The club is also open to new players joining the club, as this new initiative is suitable for any level of skill and experience. The tennis sessions will take place over 8 weeks. The sessions will include a warm-up consisting of balance and strength exercises that can be carried out on the tennis court before the main activity begins. The combination of balance and strength exercises ensures that the participants are acquiring the necessary and basic fitness components required to play tennis, which in turn will help to improve their overall fitness and tennis game. The main activity will consist of tennis drills that can be performed with a partner, thus ensuring that the participants are improving their tennis game while also enjoying the social aspect of the sport. Following this short tennis matches will be played, in which the participants can enjoy playing the game that they love while using the skills that they obtained from the aforementioned tennis drills. The sessions will conclude with a light cool down, consisting of simple and light whole body stretches. We are proud to be launching this initiative, and are looking forward to seeing you all on the day.